Peel garlic and mince the cloves of garlic in a bowl. Top with mineral or vegetable oil. Put into a warm place and allow it to infuse for at least 24 hours. Then take 1 teaspoon of the infused garlic substance and mix it with water and freshly squeezed lemon juice. Strain through a cheesecloth and pour into a spray bottle. Mix well and apply on skin before going out. Shake well before each use. It can cause eye irritation. Some homeowners add to the both recipes half a package of dry yeast. Break bulbs of garlic into cloves. Peel them off and place in a blender, fill with water so it is 1/2 to 2/3 full. Blend the mixture for a minute. Strain the chunks of garlic out and put them aside. Then place the strained garlic stuff into a container (a 1 – gallon jug) and pour water until the jug is full. Add the dry yeast if desired. Stir well. The prepared mixture is a concentrate. Keep the stuff in a cool, dry place (in a refrigerator). Use only diluted! 1/4 cup of concentrate per 1 gallon of water. Pour the 1/4 cup of mixture into a spray bottle and add 1 gallon of water. Shake well before use. For whole-yard treatment, you can fill a garden sprayer with the diluted solution as well. Spray the areas where you want to wipe out mosquitoes: over lawn grass, plants and flowers, around benches, on and around front porches in your yard. 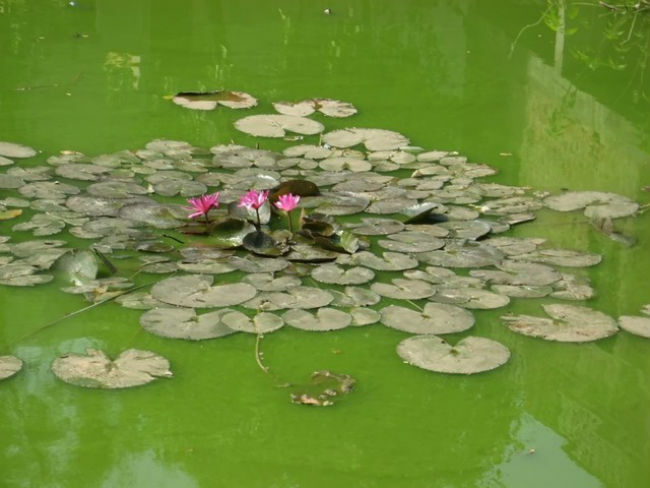 Pay attention to areas with standing water, where mosquitoes breed and congregate. This repellent spray is a fertilizer in your yard as well. The magnesium from the salt and carbohydrates from the beer nourish the plants, at the same time when the alcohol from the mouthwash keeps bugs, insects and mosquitoes away. This spray is eco-friendly and non-toxic, it is safe to plants, dogs and children. Pay attention that garlic is toxic to cats! Homemade garlic – pepper outdoor repellant against mosquitoes shows maximum protection for about 2-4 hours. Reapplication is required every 3-4 weeks during the entire mosquito season. Mosquito Barrier garlic juice is a commercial product line that is intended to wipe mosquitoes out of your yard and keep them away from your home. It provides long-lasting protection for a month. Mosquito Barrier is a very strong garlic juice concentrate made from garlic cloves. The manufacture claims that “the garlic used in Mosquito Barrier is a very powerful variety which is much more potent than the garlic found in grocery stores”. Garlic contains a natural sulfur which is responsible for mosquitoes’ repelling. The odor of sprayed Mosquito Barrier garlic juice becomes undetectable to humans within minutes, though mosquitoes can detect odor as much as 10,000 times better than a human. Mosquitoes will avoid the treated area for a month or a bit longer. Mosquito Barrier doesn’t kill harmless butterflies or bees. It is safe for kids, pets, fish and birds. Mix 4 oz of Mosquito Barrier into one gallon of water. Stir well and spray about an hour before sunset. Add 4 ounces of Mosquito Barrier, 2 ounces of canola oil and 1 teaspoon of non-scented liquid soap (not detergents) into a gallon of water in a bottle. Note: mix the Mosquito Barrier and soap together and then add to the water. Stir the entire mixture until homogenous. If you have very hard water, add a bit more soap to make everything mix well. Spray over the stagnant water about an hour before sunset. For application, it is better to use a canister type sprayer. Apply on a dry lawn and do not run sprinklers for 48 hours after application. When spraying grass with the wand on the end of your pump-up Hudson type sprayer, hold the wand nozzle about 8 inches above the grass and sweep it back and forth. Make sure the spray gets deep into the grass and use a small spray droplet size. Apply garlic mosquito repellent spray over all dark places, including sides of house, on and under porches, driveways, in vents leading to basement or beneath the house, and other non-grassy areas. 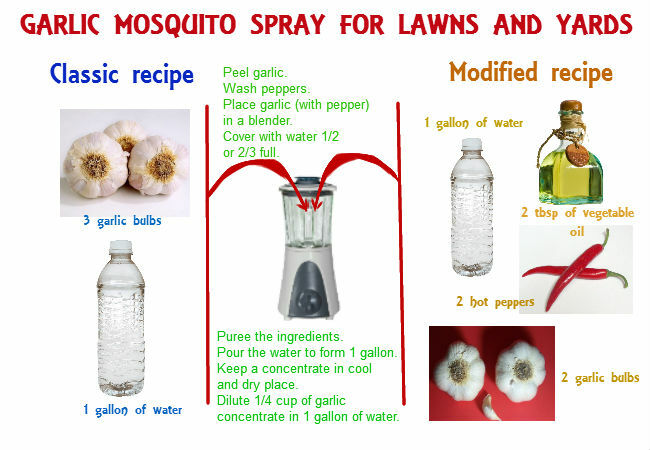 Dilution ratio 4 oz per 1 gal of water is optimal, though in some cases of high mosquito infestation, you can use 4 to 6 ounces of garlic per gallon of water. It works well and does not harm animals and plants. It is required to apply Mosquito Barrier every three weeks or four times per a mosquito season. The gallon size of garlic spray for mosquitoes is sufficient for all the year for most households even in the heaviest of infestations. Each gallon of 99.3% pure galic extract covers 5 acres which is enough for 10 applications, each quart is applied for several applications on small backyards 1.25 acres in size. No mosquitoes in your yard – no mosquitoes at your home!